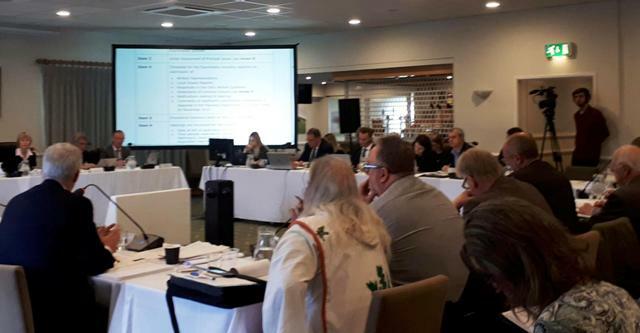 The much anticipated Preliminary Meeting for Examination of the A303 Stonehenge Development Consent Order (DCO) application was held at the invitation of the Examining Authority on 2 April. It was a crowded bureaucratic affair coloured by some unexpectedly challenging questions from participants about restrictive covenants, invisible references and administrative blunders such as sending numerous local residents the wrong date [reported by the BBC] causing our followers to enquire about the timetable two days too late. Was it the theatre of the absurd? For those who do not follow us on Facebook we recommend reading our day’s illustrated commentary based on our four posts below. 1/4. We set off to Salisbury Racecourse this morning, not for its primary purpose of horse racing but for an entirely different race that we must win, starting with the Preliminary Meeting by the Examining Authority of the A303 Stonehenge Expressway. The reception committee arrived early enough to greet fellow objectors, participants and various authorities. Printed version of Development Consent Order application, made up of over 300 documents, was available for inspection. The main room was laid out like a banquet with seats for onlookers (pictured above, top). 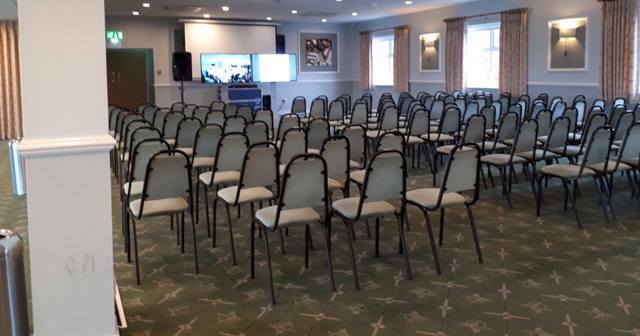 Proceedings were relayed to an almost empty overflow room with a nearby display of hard copies of all 302 application documents. We were relieved to pick up a version on a one-inch USB pen instead. 2/4. The proceedings kicked off with introductions. First, the 5 members of the Examining Authority. Then came the ‘suits’. To the left of the Examining Authority was a platoon of Highways England representatives headed up by Mr Taylor QC. 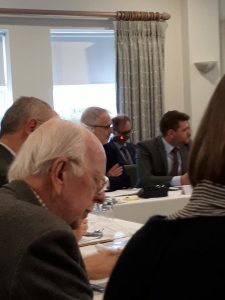 On their right were more professionals representing Wiltshire Council led by a genial Paul Brown QC, then came legal and other representatives for Historic England, English Heritage, National Trust and the Environment Agency. Some representatives of organisations joined a top table. The legal and team of professionals from Highways England are along the left. Proceedings were filmed for an independent documentary. At the table facing the Examining Authority were representatives of the Druids, Amesbury Museum and Heritage Trust, Avebury Society, Stonehenge Alliance (behind our own label! ), Blick Mead/Consortium of Archaeologists, Trail Riders’ Fellowship, landowners subject to compulsory purchase, NFU, etc. Ranged behind them sat other interested individuals and representatives of such organisations as the RSPB, the CBA and the Great Bustard Group, and a number of concerned archaeologists. Picture above. Proprietor of Amesbury Abbey asks a question about water monitoring at Blick Mead. Professor David Jacques, director of the Blick Mead research is seated next to him. 3/4. We were advised by Wendy McKay, Lead Member of the Panel of five Inspectors (the Examining Authority) that the meeting was being held simply to discuss procedural matters for the Examination which will be largely held in writing. 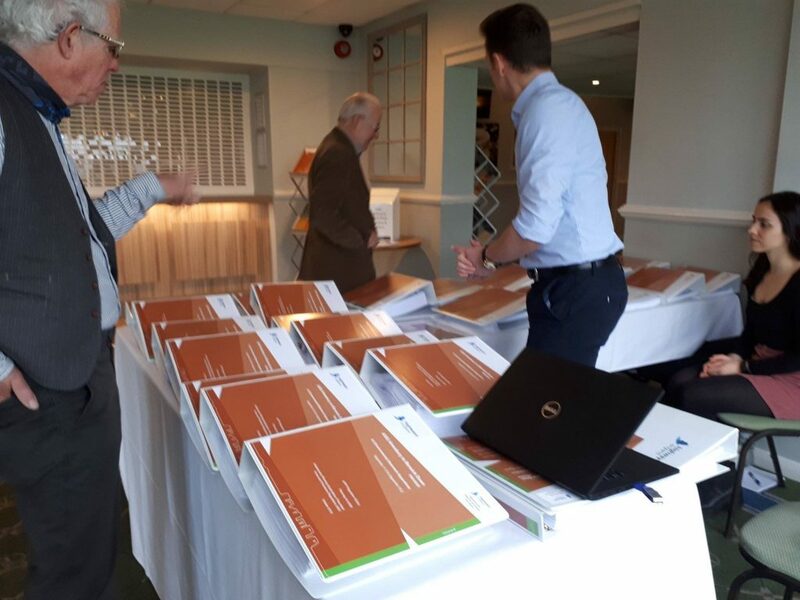 Highways England was challenged over missing documentation: Avebury Society wanted sight of the visitor survey quoted by Highways England: having been sent on a wild goose chase, eventually discovering that the authors were the National Trust who had not shared it when requested. The Trail Riders’ Fellowship were concerned about extinguished byways but their requests for information from Highways England had been met with silence. Images below left to right: Highways England team in front of the screen; Friends of the Earth ask a question; Col Parker enquires about his plan developed by Balfour Beatty. 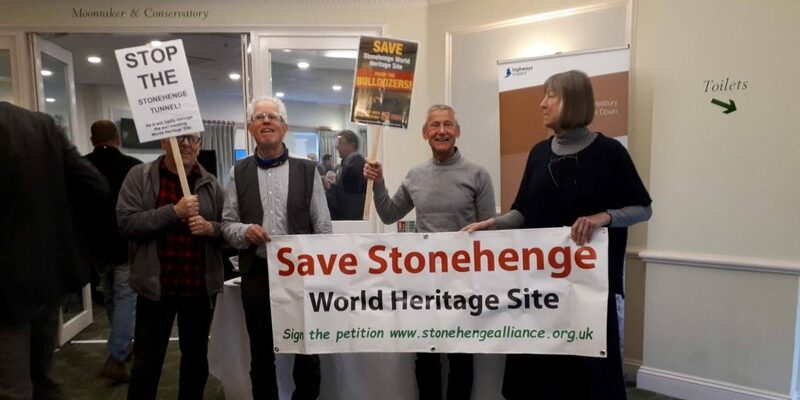 The Stonehenge Alliance couldn’t find a slot in the principal Issues to raise further concerns about the inadequacy of the Public Consultations. The Examining Authority had been told by the Department for Transport that all procedures had been complied with, hence the acceptance of the scheme to this stage. Much confusion reigned about installation of groundwater monitoring equipment at Blick Mead expected to begin on 17 April. Later in the meeting it appeared that some data on water had already been passed to the Environment Agency but more reports were expected. Dr Gillham said the scheme only paid lip service to climate change and highlighted the failure to understand the urgency of sorting out the problem in the next 11 years. Colonel Parker wanted his alternative plan included since it was so much cheaper than the tunnel. Although the Highways Agency had been given the plans by Balfour Beatty, they had not been presented as part of this DCO application. 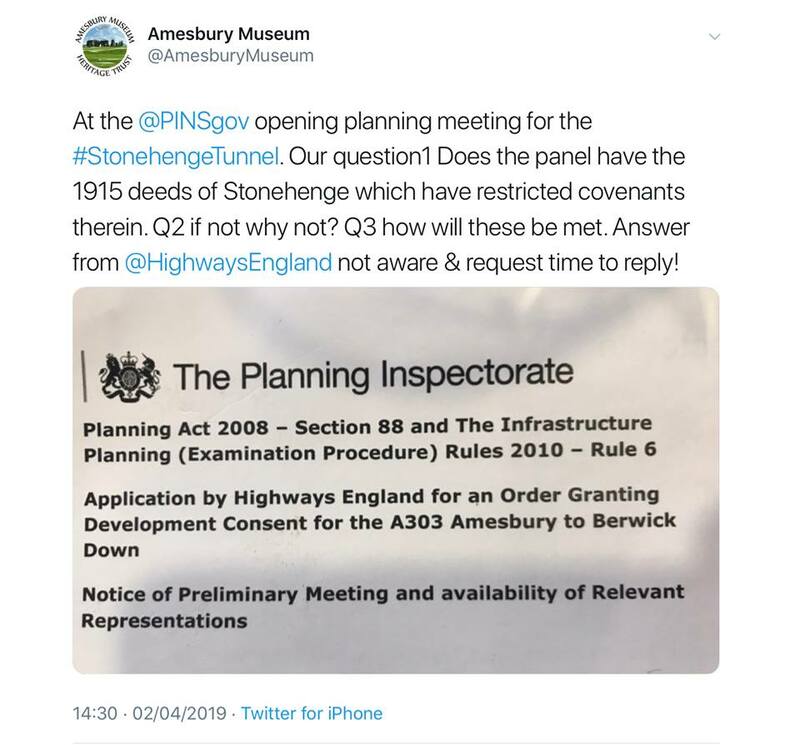 Amesbury Museum and Heritage Trust asked whether the ExA had seen the deeds to the Stonehenge property and whether there were any covenants. The Examining Authority requested information from various parties in time to meet their timetable and for the first tranche of hearings. 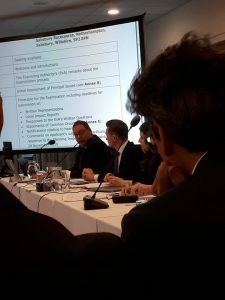 They would consider the all points raised and make their decisions known in their Rule 8 letter which would be published as soon as practicable on the website [link]. Future hearings would take place at the Civic Hall, Salisbury. Seated, centre Dr Chris Gillham with Simon Temple, transport consultant for the Stonehenge Alliance posing a question at the Preliminary Meeting. Cynicism, optimism and realism. 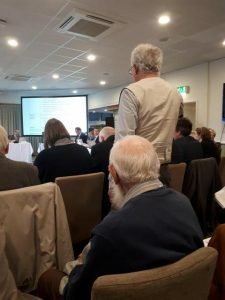 We cannot ignore the background of the panel chair, an experienced inspector whose CV includes decision-making on a fracking scheme and nuclear plant. 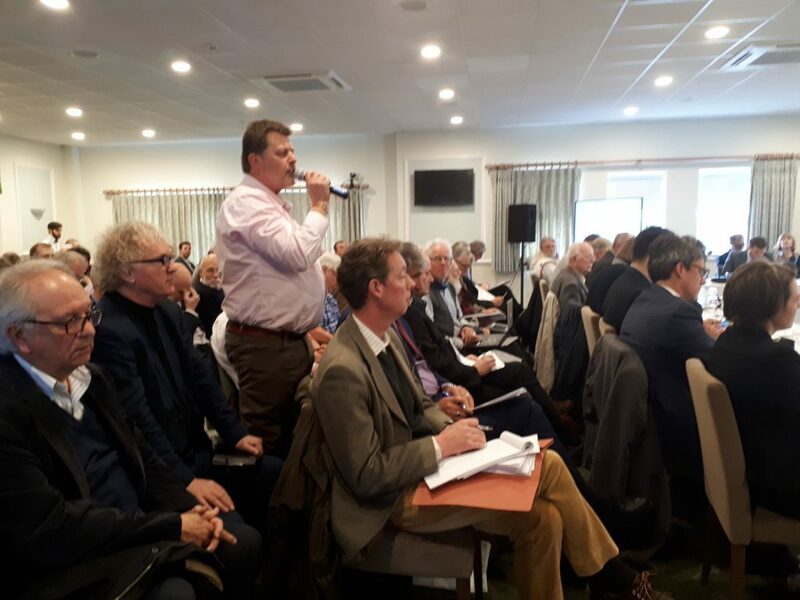 Towards the end of the proceedings veteran campaigner from Twyford Down, Chris Gillham, representing the A36 and A350 Corridor Alliance, struck a weary note of realism: this process has been designed as a rubber stamping exercise. He asked whether the panel would follow in Donald Rumsfeld’s surprisingly wise footsteps and provide for the known unknowns if precious things were discovered or unexpected water problems came about in the course of construction. The reply from one of the panel members who had refuted the charge of “rubber stamping” struck a note of empathy and genuine respect: We must consider applying conditions that “safeguard one of the most valuable sites in the world“. In the room were people who have devoted many years to defending precious places, more especially fighting for this threatened and misunderstood prehistoric World Heritage Site where people worship, wonder and find solace. There were also those present working on behalf of those who viewed the site as an opportunity to impose a ruthless ambition. The appalling insertion of a dual carriageway into this venerated landscape stands as a symbol of so many of our modern ailments and weaknesses. We now have a significant opportunity to question our values. To win this battle will be a magnificent victory. In the interests of inclusion and world wide interests the Stonehenge Alliance and others requested that hearings were live streamed. The answer to that request is due on 18 April.